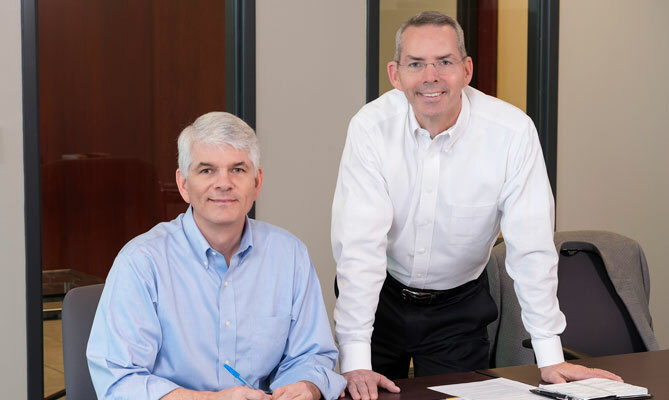 Terry and Rick are principles of the holding company (Peterson Brothers, Inc.) responsible for the connection to the business units. They spend time with the management teams engaged in applying the principles and business best practices to the individual businesses. Terry works with Corry Micronics, a producer of electronics components and subsystems. He is also responsible for Black Knight Security, a guard firm that specializes in high occupancy buildings. Terry supported the launch of Peterson Cartridge Co. a brass cartridge manufacturer of match-grade rifle shell casings. Terry also shepherds over the horizontal services that the holding company may provide the individual business units. (HR, Financial Reporting, Hazard Risk and Insurance, etc.) Rick works with VertMarkets and dba, Jameson Publishing. This is a media company that provides a variety of products (Web, Print, Events, Content, Research and Training) in six different markets. He is also connected to a few start-up companies. Make Good Media sells content creation, list management and newsletter delivery services to US firms. Rick is responsible for Echo HR a Consulting firm that provides a range of services related to Talent Management, Succession Planning and Employee Engagement and Retention. Tracy is an accountant for Peterson Brothers, Inc. and has responsibility for Holding Company reporting. She provides Multi-Family Office Services which includes investment management, monthly accounting for household income and expenses, Personal Real Estate management and other related Family Office activities. Max is an accountant for Peterson Brothers, Inc. and has an active role in Black Knight Security. He does its accounting, runs some processes and is a member of the steering committee. Max also is chair of the Audit Committee, the Health Care, and the Hazard Risk and Insurance Committees. Brad is Director of Human Resources for Peterson Brothers, Inc. He provides services for the business units related to HR legal issues and policies that help each business unit stay in compliance with changing laws. He also serves on committees that provide support to the Businesses through process efficiencies and by sharing best practices.